I am a big fan of this helmet for many reasons. I had always struggled to find a helmet that fit well and stayed comfortable for long hours. This helmet is definitely designed with a road cyclist in mind, but I have been using it for mountain biking and I would order the same helmet again. It is lightweight, comes with 2 different detachable sun visors and also comes with a padded net on the inside. I have the flourescent yellow helmet and my wife loves it, because she can pick me out in the crowd very easy. The wind flows through it very nice and it just fits really well. I was looking for a new helmet and when I picked up the Rudy Project Sponsorship, and went straight to the Windmax. I had a trail riding helmet, but was looking for something really light for 100 mile XC events and more road use. 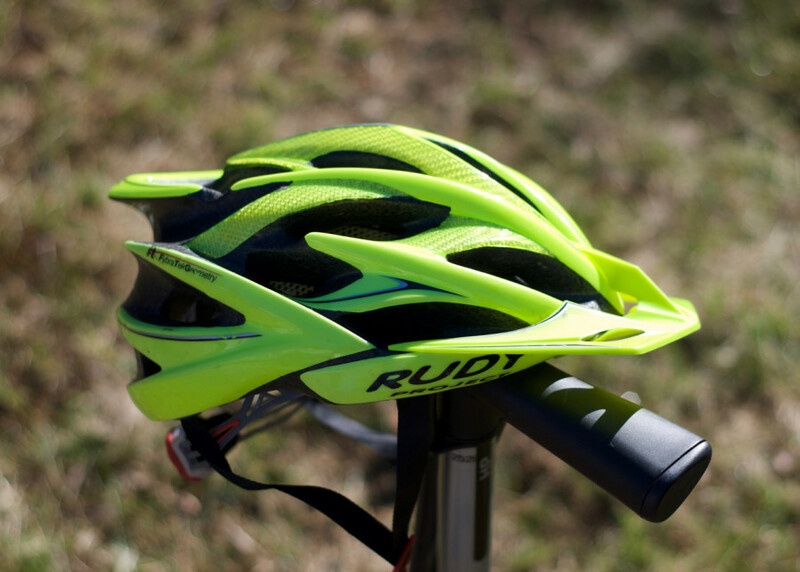 The Rudy Project Windmax is an expensive helmet, but for many reasons. The only negative thing I can think of is that the retention strap does loosen slowly over time and I may have to pull it snug every couple short rides or even once during an all day ride. The helmet has nice adjustment feature, 2 removable visors, comes with multiple pad insert options and has a full plastic overmold. Removable bug stop netting – This is advertised as a bug stop, but I think it adds to the comfort of the helmet itself. The netting helps spread the touch points and loads of the helmet around your head eliminating any hot spots. The pads are integrated into the net itself. Removable visors – My hemet came with 2 different sized removable visors. I wear this helmet for both road and mountain biking. I like to wear a visor on really sunny days to help keep sunlight off the face. Extra padding – The helmet comes with extra padding of different thickness. Soft bag – The helmet comes with a soft draw string bag for storage. Up and down adjustment – You can rotate the rear head strap up and down between 3 positions to find the perfect fit. Full shell plastic overmold – The entire outer shell has a plastic over mold and this helps hold the helmet together on impact and spread the impact loads out through a larger area. A lot of helmets have the bare foam exposed on the lower rear half. Case – There is a nice looking case that is sold as an accessory. I do not own it myself, but it does look like a nice case. This is by far the nicest all around helmet I have owned. It is an expensive helmet, but it is lightweight, lots of adjustment, nice padding options, bug net, 2 removable visors and a soft bag. I wore for 12 hours in over 100º degree heat in the Maah Daah Hey 100 and it fit like a glove. I would buy it again without hesitation and would rank it a 5 aside from the retention strap slowly loosening over time.